The Community Environmental Council (CEC), Ted Chamberlin Ranch, Cachuma Resource Conservation District, and Santa Barbara Agricultural Commissioner’s Office hosted a Healthy Soils Field Day and Compost Demonstration on Tuesday, October 23 at the Ted Chamberlin Ranch in Los Olivos. Part of grant work funded by the California Healthy Soils Program, the field day gathered an audience of over 60 local ranchers and growers to exhibit compost application and discuss the anticipated ecological and economic results for the Ted Chamberlin Ranch. Featuring group discussions, presentations by various partners, and hands-on demonstrations, topics included soil health science, the process of compost application on rangeland, managed grazing, vineyard, and open space management, integrated pest management, and carbon farm planning. Along with broader gains of improving soil health and sequestering carbon (in soil and plants), bottom-line agricultural benefits were outlined, including increased water holding capacity and increased crop productivity. The benefits he refers to are measurable and have been documented by researchers through the Natural Resource Conservation Service. For instance, a one-time application of compost resulted in a “forage productivity” increase of 16% in the first year, and a 25% increase in the second year – meaning that there is more grass for Chamberlin’s cattle to eat per acre. The compost application also led to an increase in soil health metrics such as soil stability, which allows the soil to hold more water and be more productive. Chamberlin himself has seen an increase in the presence of oak saplings, which he noted is an exciting indicator of his ranch ecosystem’s health. Granted by the California Department of Food and Agriculture (CDFA), the Healthy Soils program funds projects throughout the State, aiming to build soil carbon – effectively pulling excess carbon from the air and storing it instead in soil and plants– and reduce agricultural greenhouse gas (GHG) emissions. The hope is to replicate and demonstrate previously seen results on a wide range of crop types and acreage. The effort to address soil health locally came in part from a blueprint established by the Santa Barbara County Food Action Plan, in addition to the “Rancher to Rancher” outreach program headed by the Cachuma Resource Conservation District. Over the next three years, these types of field days will be held twice annually in support of the Healthy Soils grant objectives. These include garnering support for wide-scale adoption of carbon farming practices on agricultural land and showing the potential for the agricultural sector to become both more resilient in the face of climate change and a leader in climate change mitigation. Additional partners on this field day included the UC Cooperative Extension, Cal Poly San Luis Obispo, Premier Ag Inc., and Engel & Gray Inc. 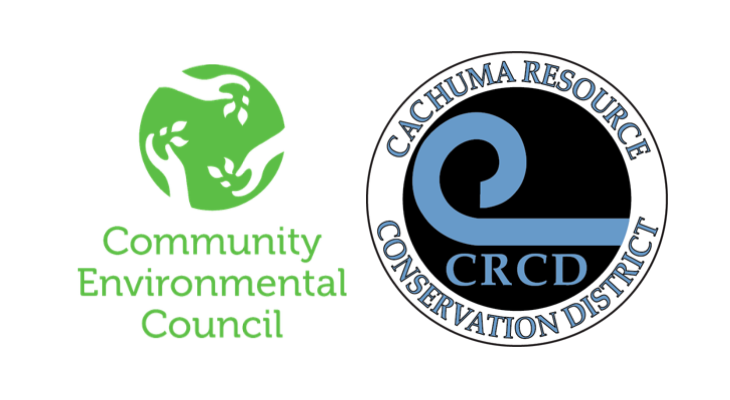 The Cachuma Resource Conservation District works in partnership with the USDA Natural Resource Conservation Service, a branch of the federal government, and many other agencies, organizations, businesses, and landowners. One of our primary purposes is to support and promote economically viable and environmentally sustainable farming and ranching operations. We have a dedicated team of partners, staff, and professional experts available to assist the community. The CRCD is almost entirely self-supporting, relying on grants and fee-for-service work to fund operations. Learn more at www.rcdsantabarbara.org. One way the CEC could ensure healthier soil is to look into the mulch that is spread at Oak Park and other parks in our County. Why is the City mulch at Oak Park always full of small plastic bits, including loads of plastic bottle caps? Also: CEC could help with soil improvement at the parks by making sure that the mowing done is done AFTER all the plastic trash is picked up. I see park lawns strewn with "shards" of plastic where the City Parks mowers have shred the plastic trash so that it goes all over the place. It's appalling.